I’ve not long come home from a lively, beautifully illustrated pair of talks at Oriel Sycharth, on the history (and the future) of the landscape of the Dee Valley. I collapse on the sofa with an end-of-the-week glass of wine, message a friend to thank her for coming along. 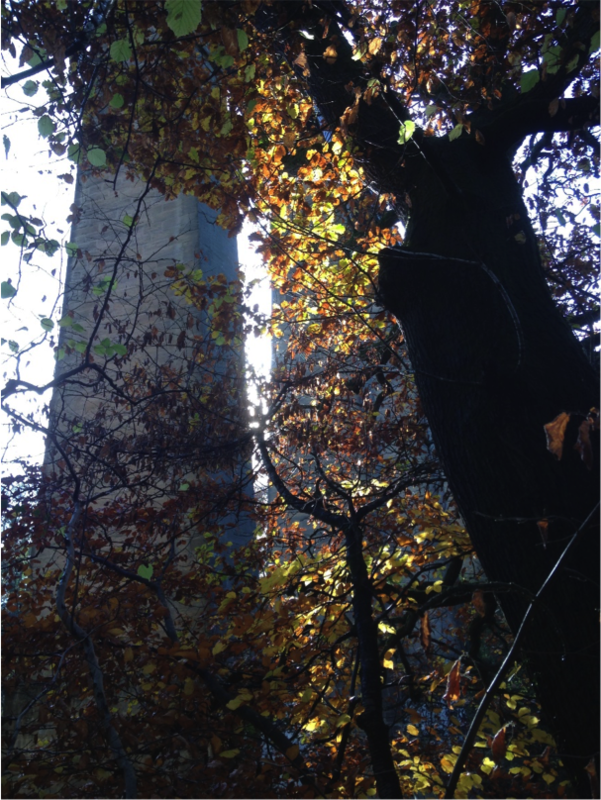 It makes me want to go back over the aqueduct, comes the quick reply…me too, I think. And so we hatch a plan for the following Friday. The kids dropped at school, I head round to collect Andrea. A few minutes southbound and we’re virtually there, winding along orange-strewn roads and through increasingly bare trees. We park up, pleasantly surprised to find no charge. Pontcysyllte Aqueduct is, since 2009, a UNESCO World Heritage Site, and generally a busy spot, though we have it to ourselves at a little after nine on a bitter November morning. Before we get quite to the aqueduct we find the canal crowded with empty barges; the place seems not yet properly awake. 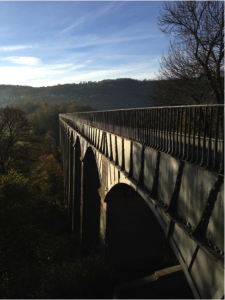 We head on round to the aqueduct – a channel of water streaming out across the valley. 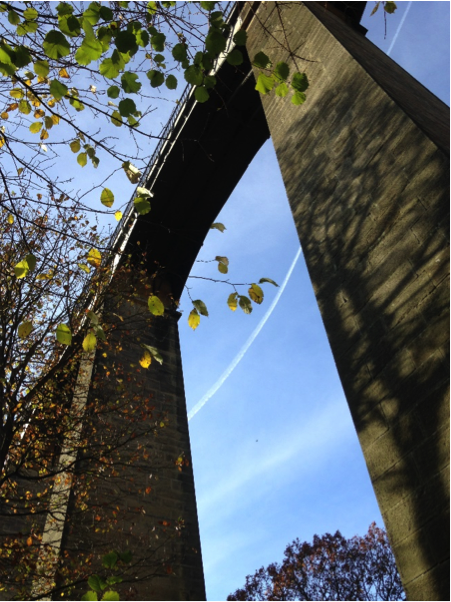 It still seems so unlikely, this towering, elegant water-filled structure bridging the River Dee. 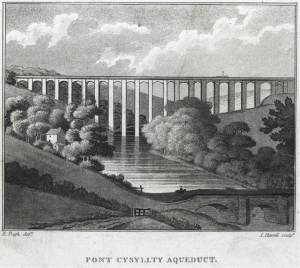 I still can’t get my head around the leap of faith it needed, in 1795 (a year of famine and riots in Wales), to imagine the aqueduct spanning an empty landscape. It took more than ten years to complete. 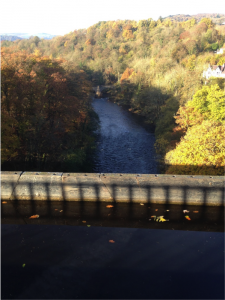 The towpath side is bordered by railings but at over a hundred feet above the river, looking down is disconcerting. Looking upstream is especially so, as there’s nothing at all between the canal edge and the drop. Gazing ahead and down, the aqueduct flows slowly to my left, at a right angle to the river powering downstream below. The competing directions, too, disorientate. Immediately across from where I’m standing, the low sun projects the railings behind me onto the lip of the canal: a fuzzy-edged miniature aqueduct. 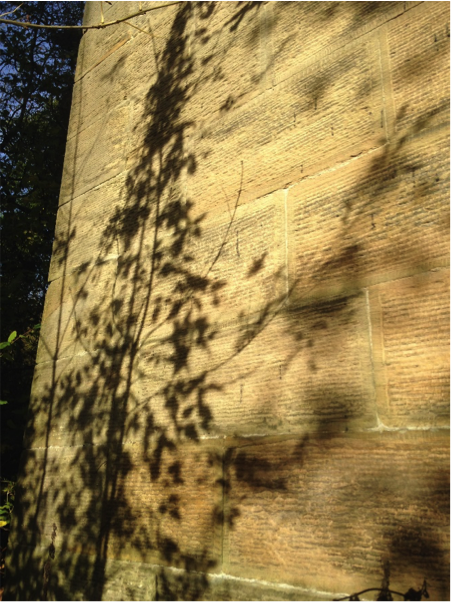 We walk on, talk on, stop to take photos, are passed by our first fellow visitor – another photographer. I’m snapping by phone, hoping for the best, but this guy looks like a pro. Andrea and I are exchanging incomprehension over events in America this week, trying (failing) to imagine voting for someone who shows nothing but contempt for you, when the canal catches my eye. 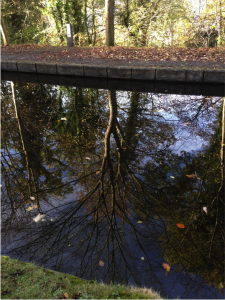 With no traffic or even wildlife to disturb it, the water is a black mirror, tipping the trees on the far bank upside down. 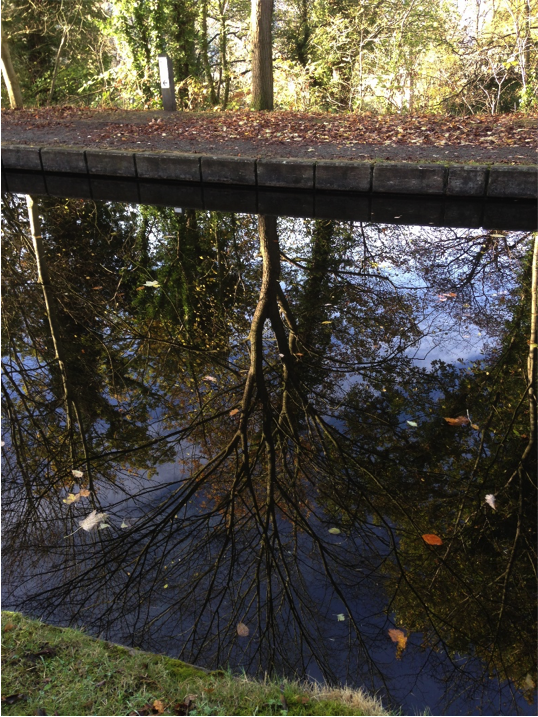 A few leaves stick to the surface; others hang motionless within the water. We keep walking, colder now under the canopy of this part of the towpath. The canal veers left, and we try to get a view of the aqueduct from a little distance. Too many trees obstruct the view. We stop and smile at a notice asking visitors not to disturb the ducks. 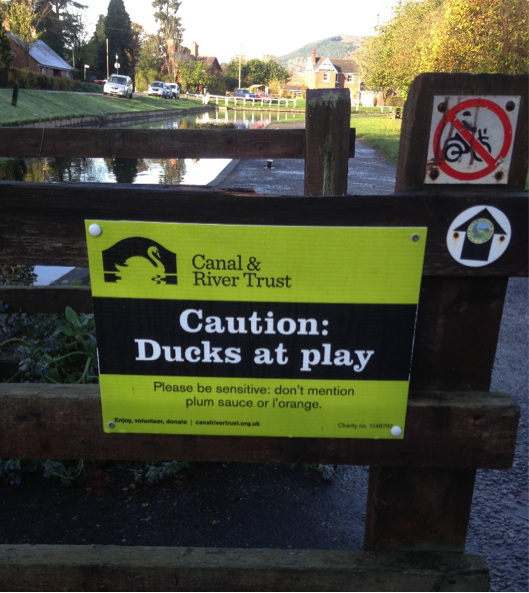 Health and safety information isn’t, after all, known for its humour. We turn back, keen to head down to the riverbank. 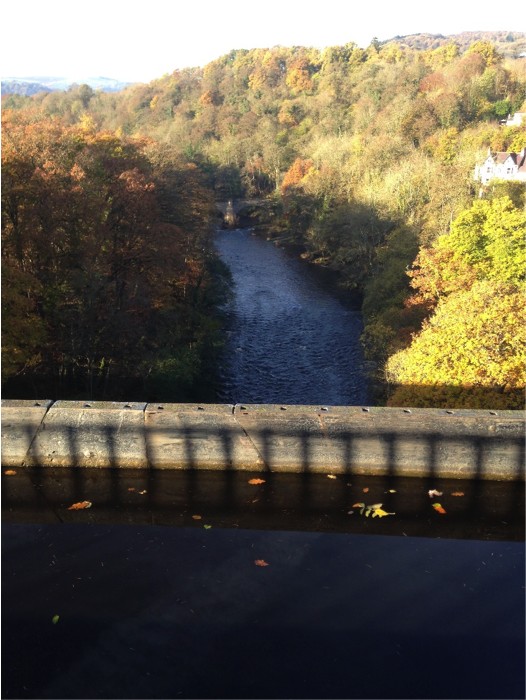 Down here, the aqueduct, its massive feet planted in the Dee, seems more unlikely than ever. How do you even begin to build in these fierce waters? Looking up is masonry and iron on blue sky. 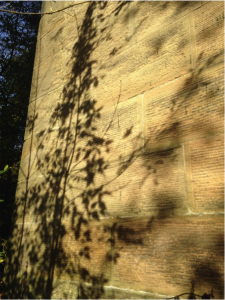 Shadows of trees stretch across the pillars, something like a tangle of nerve endings. We walk a little way down the path towards Tŷ Mawr country park. Andrea crouches to photograph some leaves, but the path is also marked by grey-white feathers, then some spotted with blood, then a torn-off leg, still bright red at the top. We quickly look away, climb back up to the canal. We’ve been wandering for the best part of a couple of hours, and by now the place is pretty busy, even in three-degree temperatures. The snack kiosk has opened and looks seriously tempting, but we’re suddenly conscious of all the other jobs awaiting us today: soup and cake will have to wait. For a full account of the aqueduct’s history, see Peter Wakelin’s 2015 book. And see Andrea’s November 2015 blogpost for Curious Travellers here. This entry was posted in Walkers' Blog on 22nd November 2016 by Luca Guariento.